The 'Paint a Reiksguard knight' challenge! 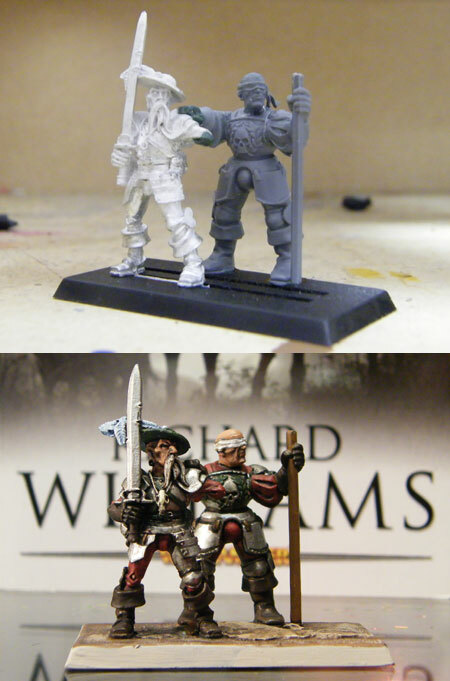 As a bit of fun leading up to Reiksguard's pre-release at Black Library Live, Richard has been visiting a bunch of GW stores around London and, as well as chatting with staff and fans, have been converting and painting a miniature to represent one of the characters from the novel. 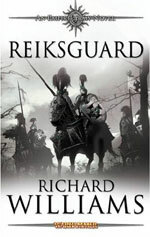 "The novel Reiksguard is all about heroes. Not only the knights, but also the goblin warlord and the ogre tyrant are all heroes to their own people. And there's no fitter thing for a hero than to be immortalised in model form!" Theodericsson Gausser could not be more different from his domineering grandfather, the prideful, grasping Elector Count of Nordland. He is slow to anger, but an implacable foe when roused. Thoughtful and tremendously loyal to his friends, Gausser more than any other embodies the Reiksguard code of brotherhood. "My model for Gausser's look, even while writing the novel, was based on Vladimir Kulich as Buliwyf in the film 'The 13th Warrior'. Gausser looms even over Delmar so his miniature had to be BIG, bigger even than a Reiksguard knight. I used a plastic Chaos Warrior as a base and removed some of the more 'Chaosy' bits. The runestone and the slightly wilder look was in keeping with the Nordlanders (who share more of their heritage with the marauder Norscan tribes across the Sea of Claws than any of them would ever admit). I used a straight sword and a head from the plastic Bretonnian knights. I filled in some of the holes in the cloak with green-stuff and modelled some extra hair with one of the store's paper-clips. Painting-wise, given the model's 'Chaotic' background, I knew it was important to emphasise its Empire allegiance so I emphasised the standard Reiksguard colours of red and white, using a lighter silver for the armour than the darker metal Chaos followers would wear. The fur across the shoulders, while not standard Reiksguard wear, would be worn when fighting in colder climates (indeed, that's just the case when the knights return to Nordland at the end of the novel)." The dwarfen realm of Karak Angazhar has been besieged by the orcs, goblins and other evil creatures for as long as any dwarf can remember. Despite this, the proud dwarfs of Karak Angazhar eschew contact with others, trading only even with their human allies of the Empire at a good arm's length. But with the rise of Thorntoad, Gramrik fears that his realm may end with him. "As soon as I saw this model, I knew I had to use it for Gramrik. Its brooding, intense expression was perfect for the besieged King of Karak Angazhar. Many of the dwarfen hero miniatures are more extravagant, with winged or horned helmets. This one, though, carries a far simpler helm, which I thought far more appropriate for the practical Gramrik. The only addition I had to make was to convert the reverse of the axe head into a hammer to represent the axe-hammer Gramrik wields. This was achieved by cutting down a blob of green stuff with a wet modelling knife, then styling in the flame edging with the tip of a nail. Painting-wise, I didn't want Gramrik to be lost amidst the red, white and silver Reiksguard so I chose a contrasting bronze and green colour scheme. The green sets the tone for this earthy and secretive kingdom, while the bronze gives a 'classical' ancient look for their armour." Delmar von Reinhardt has a lot to live up to. His great-grandfather was one of the first Reiksguard knights, his grandfather served and his father died fighting beneath a Reiksguard banner. Delmar is proud of his family's legacy, but knows it only places all the more expectation upon him. He has the blood of heroes in his veins, but what if his best is not good enough? "I'm not quite finished on this model yet, but I wanted to show the work so far. Delmar's particular talent is as a horse-rider and so his model had to be a cavalryman. I wanted a model that demonstrated his skill and the action of the rearing horse of the Empire general fitted that perfectly. The Empire general and his horse wear ornate customised armour, befitting a champion, but while Delmar is the hero of the novel, he is still a young knight. To reduce the 'ornateness', I used a regular warhorse head and played down the sculpture on the barding. Additionally, I replaced the bulky general's arms with slimmer ones from the Empire knights sprue. The overall effect retains the dynamism of the horse's movement, and yet does not have Delmar stand out too much within a squadron of his brothers. He has the potential for greatness, but he has a distance to go before he can achieve it." The Grand Order of the Reiksguard takes care of its own. The Order becomes a home to many knights, so much so that even if crippled in battle they are loathe to leave. The Order shelters them all, and finds each one another manner by which to serve. Those most skilled in arms are elevated to the role of Fightmaster, instructing novices in the Reiksguard's way of war, with lance, sword and fist, and training them to become warriors fit to guard the life of an Emperor! "I'd been looking forward to modelling Talhoffer and Ott since the beginning. Unlike the younger knights, these men have decades of experience and are simply awash with character. The haughty, yet brilliant sword instructor Talhoffer, and the quiet, yet formidable wrestling master Ott. As different as two knights can be, but bound close by unbreakable bonds of brotherhood and fellowship. 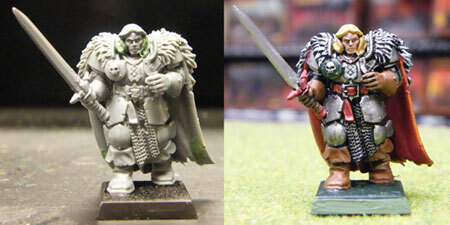 To find a model worthy of Talhoffer, I plumbed the archives of the Mordheim range. Each one of these models is etched with a distinct personality. The model I found, the freelancer knight, looked nothing like I had imagined Talhoffer, yet his expression and stance conveyed the fightmaster perfectly. It was then a simple job to snip off the left arm to show Talhoffer's injury and use a little green-stuff to fold the sleeve over. Ott proved more of a challenge. There was no basic miniature that seemed right for him, so I looked to put him together from a selection of Empire plastics. I used the army standard bearer for the base figure, as I think this one is closest to an Empire foot knight, then I had to buy a whole regiment of flagellants to get the head I wanted. Ott's injuries burnt away his hair and he wears a blindfold much of the time to protect his injured eyes. Rather than try to model a blindfold onto another head, my brother cut the excess hair from the flagellant, carving out a new ear in the process. Given Ott's burns, the slightly disfigured result is well in keeping with the character. The final change was with Ott's right hand. The pose of the models is based upon the WW1 photos of the injured men, blinded by gas, walking in line, each one with his hand on the shoulder of the man in front. I incorporated that image in the book when we first meet these characters, and I wanted to do the same here. There was simply no hand that I could use that would properly integrate the two models, so once again green stuff came to the rescue. With no little trepidation on my part, I clipped the old hand off and sculpted a new one in, my respect for the Citadel modellers soaring." Siebrecht never expected to find himself a novice of the Reiksguard. Uprooted from his life of wine and women amongst the dissolute noble sons of Nuln, Siebrecht has little regard for the Order or the Reikland Emperor they protect. With a fearsome skill with rapier and pistol learned in a hundred back-street skirmishes, he knows he is more than a match for any Reiklander novice who thinks to put him in his place. 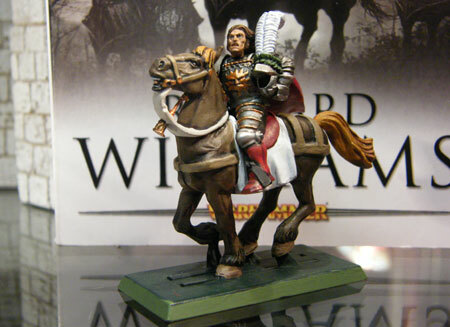 "Siebrecht is another great example of how one can mix the Empire plastics range to produce characterful models. Siebrecht's skill is with the sword and the pistol, which he refuses to give up, so both these weapons had to be displayed prominently. Using the base of an Empire knight, the model also includes the arm of a pistolier, a White Wolf and the head from a Bretonnian. When it came to painting, I wanted to use a more striking palette than the red and silver that I'd used for knights so far. Even as part of the Reiksguard, Siebrecht likes to assert a certain independence. While his horse's gear and his own dress is Reiksguard red, he wears his family colour of yellow on his breastplate and sheath. This colour contrasts nicely with his black hair and, along with the white undershirt and grey horse, lightens the whole model and makes him stand out from the rest." Amidst the schemes and intrigues of the noble classes of Talabheim, influence is valued more highly than gold. There is no better path to befriend the future leaders of the Empire than to join the most prestigious Reiksguard. Krieglitz knows the boon he can provide his family if he gains glory. Repelled by the arrogant Reiklanders and distracted by the escapades of Siebrecht the Provincials, can Krieglitz find the strength within himself to succeed? "For the Talabheimer Krieglitz, I wanted to show something a little different. On campaign, the Reiksguard knights are not always in battle. As all soldiers, much of their time is spent on the march (or in the saddle in their case). 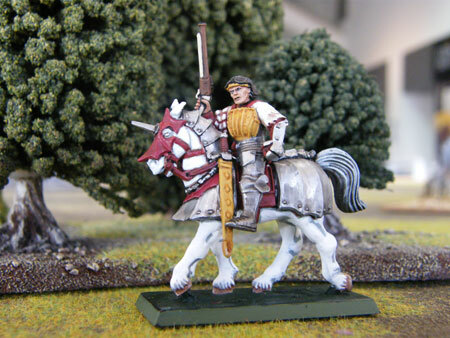 I used a pistolier horse in place of the armoured warhorse and the cloak from the same sprue, painted Reiksguard red. The horse and the cloak give a great impression of movement, one can imagine that Krieglitz here has an urgent message to deliver. Painting-wise, I chose a darker palette for Krieglitz than his fellow provincial Siebrecht, reflecting his more sober disposition. 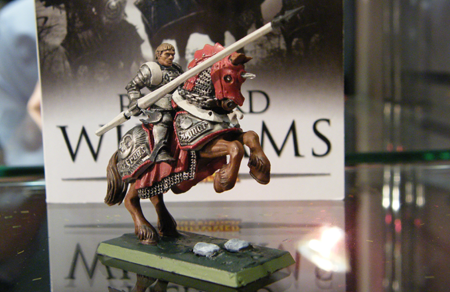 I painted the harness grey so as to work into the model the Talaheim colours of grey and red. The breastplate motif is also a reference to Talaheim's symbol of a comet." After the slaughter of his clan at the Battle of a Hundred Cannon, the bull-ogre Burakk believed that his brutal, joyful existence was at an end. Instead, he was found by Thorntoad, who recognised a use for a monster able to swallow goblin and dwarf alike in a single gulp. Restored to strength, and with a clan of his own to command, Burakk is Thorntoad's greatest weapon, and the most terrifying threat to the dwarfs of Karak Angazhar. "Unlike the heroes of the Reiksguard, the antagonists of the novel were to prove incredibly challenging to model. 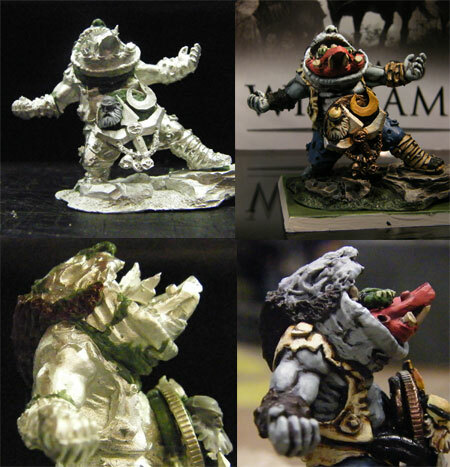 My descriptions of Burakk and Thorntoad were intended to be striking and unique, certainly not something I could easily find in the existing GW miniatures range! One of Burakk's features in the novel is that he can swallow a dwarf or a goblin whole (this struck me as a very ogrish thing to be able to do) and so I decided that the model should focus on this. The mouths of the normal ogre models, while brutish, are too small to be convincing. There is really only one model in the range with a mouth big enough, Gobbla! I used Gobbla's head with a copious amount of green-stuff to model in the hair and fill the gaps. The body came from an Ogre Maneater. The ragged clothes and fabric around the feet fit well with Burakk's background as a desperate survivor of a defeated horde. The finishing touches were to add the all-important gut-plate. I decorated it with some appropriate items, a dwarfen head and a couple of goblin icons, linking Burakk with Thorntoad's forces. The paint-job was more important for Burakk than any other model. As you can see from the photos, prior to painting he looks a mess of metal and green-stuff. The paint-job had to bring the disparate parts of the model together. I chose to base the colour scheme around blue to contrast with the red of the knights and green & yellow of the goblins. The flesh was painted grey-blue, the trousers a darker blue and, as a secondary, a skin / hide colour for the jacket (perhaps made from creatures Burakk skinned himself...). The last touches were the rotting flesh of the dwarf head, the rusty goblin trident and the green feet and black cloak of the unfortunate goblin Burakk is swallowing!" Once treated as an abhorrent freak fit only to herd the squigs, Thorntoad's rise to power was swift as it was savage. When his opportunity came he seized it, breaking apart those who stood in his way with his powerful arms or impaling them upon the spines that cover his body. The Ten Tribes serve him, for now, but Thorntoad knows that only if he can bury the dwarfs of Karak Angazhar, will his grip on power be absolute. "As with Burakk, when I wrote Thorntoad I never expected to be modelling him (if I had done, I might have tried to make life easier for myself!) Thorntoad, of all the models in this tour, is probably most a gaming representation rather than what I intended him to look like. Thorntoad's "thorns" had to be the dominant feature of the model. Rather than have a few discrete spikes here and there, or assume that his 'quills' were lowered and not include them, I wanted to make them as obvious as possible. The quills were made by drilling the back and sides of the model, then filling in the holes with putty and sticking a pair of quills in each (actually the bristles from a scrubbing brush). The quills prevent Thorntoad resting properly, so he couldn't be carried in a chair. Instead I wanted his palanquin to have a large area to allow Thorntoad to roam across it, striking at enemies where he wished. 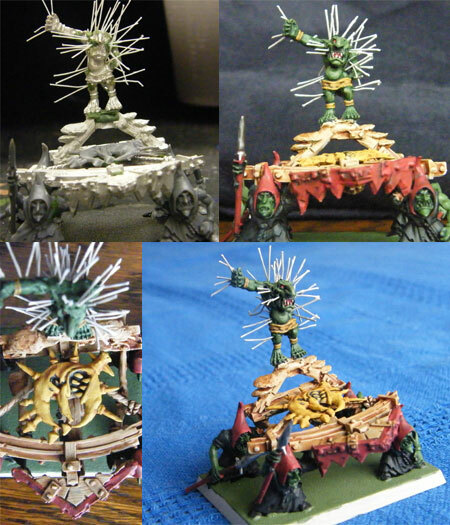 It was assembled from components of the goblin bolt thrower and from the night goblin regiment box. Thorntoad was my last model of the tour, put together at GW Nottingham a day before it needed to be used at Black Library Live. Given the complexity of the assembly, I was left with precious little time to paint it before the store's closing time. 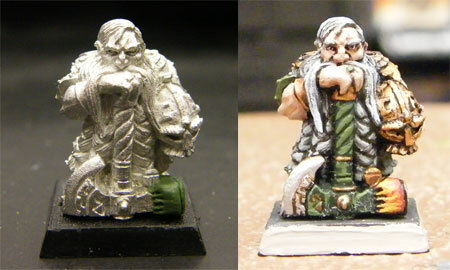 Fortunately, I've improved my speed-painting considerably since taking all day to paint a dwarf back at Bromley! I kept myself to as few base colours as possible, mainly yellows and greens, then used GW's excellent washes to provide the highlights and shadows. I used a stronger yellow to bring out the moon symbol, and reds to denote hats of the Death Caps, the tribe of the goblin bearers. The end result is rudimentary, and certainly the craziest miniature I've ever made, but it catches the eye on the tabletop, which is what the best hero models should do!"